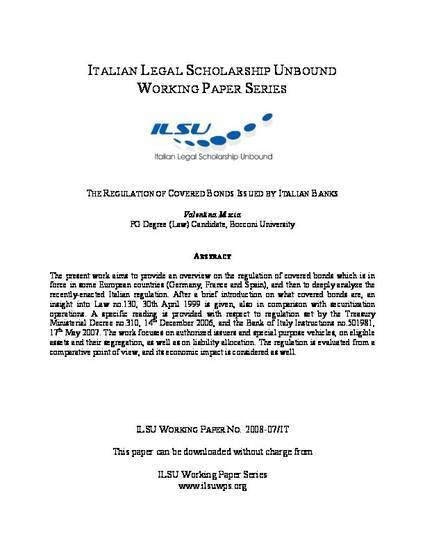 The present work aims to provide an overview on the regulation of covered bonds which is in force in some European countries (Germany, France and Spain), and then to deeply analyze the recently-enacted Italian regulation. After a brief introduction on what covered bonds are, an insight into Law no.130, 30th April 1999 is given, also in comparison with securitization operations. A specific reading is provided with respect to regulation set by the Treasury Ministerial Decree no.310, 14th December 2006, and the Bank of Italy Instructions no.501981, 17th May 2007. The work focuses on authorized issuers and special purpose vehicles, on eligible assets and their segregation, as well as on liability allocation. The regulation is evaluated from a comparative point of view, and its economic impact is considered as well.